Video clip synopsis – A young boy plays along with a musical game during one of the many ABC broadcasts for children. 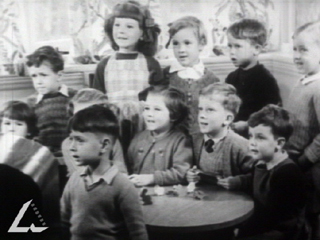 Children from around Australia tune into a kindergarten broadcast over the ABC. Tim Bowden remembers the ABC children's program The Argonauts . Broadband MP4 families_bb.mp4 (9.7MB), suitable for iPods and computer downloads. The first video clip is an excerpt from the film This is the ABC produced by the Film Division of the Department for the Interior for the Australian Broadcasting Commission in 1955. The second video clip is an excerpt from the film The Invisible Link, produced by the Department of the Interior for the Postmaster-General’s Department for the Australian National Film Board in 1951. Both archival video clips are on the From Wireless to Web website, produced in 2005. Students read and view texts that entertain. They read and view imaginative texts. These texts contain characters, settings and plots developed in some detail, and may contain topics and issues that extend beyond the immediate plot. Students understand that the main ideas in imaginative texts are developed through interconnecting plot, character and setting. They identify how language is used to portray characters, people and events in particular ways (eg to create a positive or negative perspective). Students write texts for known readers to entertain, inform and persuade in print and electronic mediums. They write imaginative texts that may include stories, simple poems and scripts. They understand that writers can explore their own ideas and feelings through the characters and situations they create in imaginative texts. When students write imaginative texts, they describe characters and settings and use dialogue. They develop a storyline of sequenced events with a problem and a resolution and include details relevant to the storyline. They create an ending that draws together elements of the storyline, sometimes in a resolution. Students understand that speaking and listening provides opportunities to clarify ideas and understandings on a topic, to give simple arguments and to seek the opinions of others. They understand that people, places, events and things can be portrayed in particular ways. The wireless delivered education and entertainment to children, companionship to women at home, and gave families an evening pastime. The ABC’s Children’s Session with its Argonauts Club began in 1933, and by 1950 the club boasted 50,000 members. School lessons were broadcast in all States. Programs such as Women’s Session and Banish Drudgery dominated morning slots, with hints on health, mothercraft, the science of beauty, cooking and cleaning. Popular recorded music (English and American crooners and dance bands) was the staple of the commercial radio stations. the Kindergarten of the Air clip- what signals to us that this is a program from a long time ago? Is there a comparable radio program for very young children today? Compare Play School on ABC TV with the style of this program. the reasons why radio dramas and programs a such as the Argonauts were popular in the 1950’s. Scan the dial of a radio and ask students to name the genres of programs they hear: music, talk, news, interviews, issues etc. Or copy or download a variety of clips of radio from the Internet. Radio drama is still broadcast on radio national on the ABC, and book readings. Try to listen to a selection of these. Go to The ABC celebrates 100 years for more about children’s programs.